CTC Devon publish a colour magazine called "The Highwayman". Ten issues are published each year and it is circulated to around 200 members. Each issue is usually around 32 pages long and contains reports of recent Runs as well as News, Touring and General Articles. Enclosed with each issue is a convenient list of planned rides and events for the next 6 weeks. 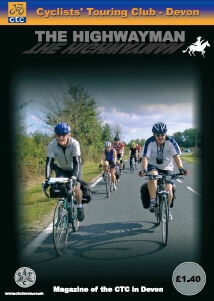 A sample copy of the Highwayman (from June 2009) is available on-line. The subscription year runs from October. Please email Shaun for details of current subscription rates. Reduced rates are available for OAPs and for collection by hand (e.g. on Coffee Pot Rides). Contributions for the magazine should be sent via email to the editor Shaun East Hi resolution copies of photographs or originals would be preferred if possible. An archive of back issues of the Highwayman is being maintained in electronic form as pdf files. At present this archive is only available to Committee Members. This page was last edited on 19 August 2018, at 17:50.